I don't know who you are or what your name is, actor who plays Julie Powell's Cubicle-Mate. But I do feel sorry for you. I know what it's like to be around Julie Powell. And it's not fun. She's talkative. She's self-absorbed. She's prone to wild mood swings. I can't imagine what it'd be like to have to hear her whiny little fetal pig squeal voice for an entire workday. I mean, working in a cubicle at the Lower Manhattan Development Corporation is probably a stressful job as it is. But trying to do that while dealing with the most annoying cubicle-mate ever? LIVING HELL. Those headphones are probably pumping in looped sounds of nails on a chalkboard. I'd rather listen to that than Julie Powell's voice. I don't know how you do it, bro. This is the first time in awhile I've actually been glad to be me. I only have to be around Julie Powell for an hour a day. You have to do it for eight. Godspeed, dude. this is Julie Powell. Can you hold?" "...the most annoying cubicle-mate ever?" I think you have seen the movie too many times, and that is what you are annoyed by. Julie Powell may not be the most interesting-fun-tolerable cubicle-mate ever, but if you think she is the 'worst,' then you must have an exceptionally sweet arrangement in your work. Seventy more viewings? Good luck. Word of the day: hyperbole. ... but you have to watch, and (almost) care about what Julie P. does. 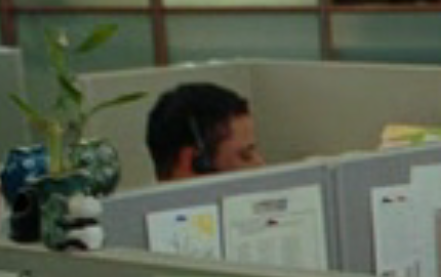 The cubicle mate can just put his headphones on and ignore her. I recognize it here, and some times in my own writing... like when I am less than inspired, or feeling too tired/bored to delve deeper, but perhaps in this case delving deeper is exactly what Lawrence is tired and bored of doing for this movie. Louis Vuitton ladies handbag managers, remember to listen up. We are picking out a great deal of Louis totes around which have been staying misused along with mishandled. These kind of important fake chanel totes must be managed similar to new child children. Which has a delicate effect and several enjoy. Louis Vuitton totes are generally many of the most deluxe coming from all totes. You will need to rolex replica uk take pleasure in your efforts along with quality place into every single Louis object. These are generally certainly not your current regular developer totes. Whenever they ended up, and then additional men and women can be going for walks your roadways using true versions. You know what I am just expressing? Here is a problem in your case. As well as thought about hublot replica sale precisely why ladies handbag makers create consequently a lot of the very same kind of luggage, only in several hues as well as product? My spouse and i generally thought about that will very same problem until eventually the idea reach us some day, even though ranking inside rainwater, clutching our handbag for you to our chest muscles, as it ended up being your baby. Makers be aware that a number of certain hublot replica sale totes are certainly not used to always be donned in certain periods. At that moment inside rainwater My spouse and i established the real reason for your multiples of a single certain handbag. It can be straightforward while you approach the idea. Don't assume all luggage could tolerate most conditions. A number of luggage are produced using distinct textiles that you can contain the fashion you desire for every single issue. As an illustration; your Denim Rapid 40 has not been supposed, the slightest bit, to get donned inside rainwater.